With our vessel head cutting machines and vessel head cutting services one can cut any shape on a vessel head extremely accurately and with a bevel. Our vessel head cutting machines and services automate the labor intensive laying out of hole pattern on a dish end for the pressure vessel industry. This saves you time on fitting and minimizes the weld volume. 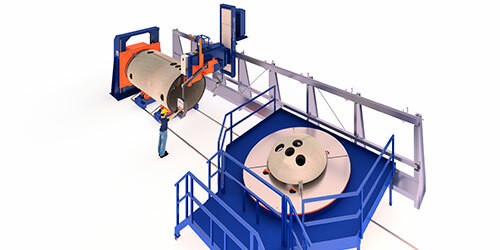 The SPC 1500–3000 VHC pipe and vessel head cutting machine is the answer to pressure vessel manufacturers struggling with and spending too much time on lay outs. The VHC saves you time on cutting, fitting and welding.